If you have gotten to this page you realize that a good orthotic will probably go a long way in eliminating your foot, ankle, leg or lower back problem, BUT, in your particular situation you are required to wear a dress shoe on a regular basis and as you have learned from visiting this site an orthotic will only work if you can wear it on a regular basis. The SUPERSTEP ORTHOTIC works wonders in casual shoes, sneakers, boots, etc. but like most "off the shelf" orthotics it has a limitation in dressier shoes. So, they may be great for weekend casual wear, or on the golf course or tennis court, or for those who work on their feet and wear boots all day, but for many they just will not fit in certain shoes. Fortunately, there is a great solution to this problem and it is the REDITHOTIC 3/4 ORTHOTIC. This orthotic is also made of a "poly grade" shell like prescription orthotics, but unlike the REDITHOTIC ORTHOTIC it extends to just behind the ball of the foot, thus eliminating a good deal of the orthotic that just "takes up space" in the shoe. Any foot specialist will tell you that the actual control of any orthotic is from the heel to the ball of the foot. Anything beyond that is basically just filler. Some of you may be wondering if the orthotic will slide while in your shoe because it does not fit the full length of the shoe and the answer is absolutely not. The reason it will not slide is because once it is under your arch and takes up the contour of your foot, it is locked into place. As a side note, in my practice, easily 95% of the prescription orthotics that I have made for my patients are NOT full length orthotics, again, because the part of the orthotic beyond the ball of the foot does virtually nothing to relieve pain. 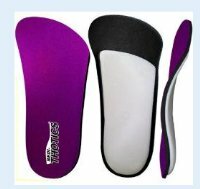 Additionally, the REDITHOTIC 3/4 ORTHOTIC is cut narrower from side to side thus allowing it to fit into a greater variety of shoes. The REDITHOTIC 3/4 ORTHOTIC also has a cushioned, bacterial destroying topcover for added comfort. Like the KLM ORTHOTIC, the REDITHOTIC 3/4 ORTHOTIC is virtually indestructible. Unless you lose them or the dog chews them up, they will last for years. The REDITHOTIC 3/4 ORTHOTIC only comes in one thickness or flexibility, however, you have some customization options depending on your weight and particular foot problem. 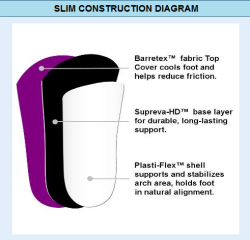 For those who weigh over 175 pounds, I would recommend you order the REDITHOTIC 3/4 ORTHOTIC with an arch booster for all foot conditions, which is a device that we will add to the bottom of both orthotics to adequately support larger people. If you suffer from Morton's neuroma, capsulitis, metatarsalgia or sesamoiditis, I would recommend (actually insist) you order the orthotics with a metatarsal pad that we will add to both orthotics. This is a very important component in an orthotic for those who suffer from these particular problems. The types of shoes that the REDITHOTIC 3/4 ORTHOTIC will fit in include men's dress shoes both tie and loafers. For women they will fit in dress flats, low heel pumps, but will not fit in high spiked heels. The topcover of the orthotic may be trimmed in the front in order to fit in a greater variety of shoes. Please keep in mind that this orthotic may or may not fit properly in casual shoes like sneakers and they are NOT meant to be used as an athletic orthotic. The price for the REDITHOTIC ORTHOTIC is $50.00 (on sale $35.00) per pair plus S+H. Additionally, I am offering a 60 day no questions asked return policy (one pair limit). Why 60 days? Simple, many foot problems take time to heal and although some foot conditions will dramatically improve as soon as you start wearing a good orthotic, other foot problems may take longer. The time period is predicated on a number of factors not limited to the problem alone, but also things like daily activity, work requirements, shoe selection and body weight. So, if after 60 days your foot pain is no better than before you tried the REDITHOTIC 3/4 ORTHOTIC, simply return the orthotics to me (they MUST be returned) and we will refund your money, shipping charges not included. I had to thank you again for your willingness to help all of us poor foot PAIN VICTIMS--but also for your products. I ordered the 3/4 orthotic with the added metatarsal pad--and MY GOODNESS...instant relief. I am not afraid to walk anymore, as I was waiting for my appointment on Thursday. After I fell--two weeks after my cheilectomy, the pain in my other four toes was bad--not severe, but present. With the orthotic, the pressure is off the region and I am more confident and more sure-footed, which is CRUCIAL these days! Thank you again--I highly recommend that orthotic. I spent a lot of money online and in various stores and never found anything like yours. For only $50 plus the metatarsal pad, the relief was worth TEN times that amount--actually, it was priceless. I can't believe how a rigid but comfortable, yet thin, orthotic could make such a difference--but it did!